I wanted to share with you all a few of my favourite spots from my last trip to Chicago a little over a month ago. I had the pleasure of exploring this awesome city and finding a few cool suggestions for you guys to check out. If you have has a chance to speak with me since I last visited, I fell in love with this city as if it was a fish taco (with extra guac)! Seriously, madly in love! Not only did I have the chance to explore for work and pleasure, I was also traveling alone and met incredible, genuine, business minded individuals. This city has people who get it. With a trendy vibe and sports heart, there are many similarities to the two places I have called home in my life time, Montreal and New York. This city is my happy medium between the two. With that in mind, I explored for about 4 days and stumbled upon tons of instagram worthy, tasty and exciting fun spots. Here are my recommendations from my visit. First up, my favourites always Mexican spots:Big Star I was taken to this spot in the heart of West Loop by two incredible friends I met along my trip. I shared my love for mexican and they knew just the spot. Big Star has a great outdoor terrace, amazing margaritas and tacos options to die for. El Hefe Best known for their wild Sundays, El Hefe gets your sunday funday started, and the food is actually awesome! Since they serve up margaritas with names like "La Chica Flaga" and "Salty Chihuahua" it was hard to resist. Spoke and Bird Cafe I stumbled upon this incredible cafe called Spoke and Bird. They had incredible coffee and a cute outdoor patio. 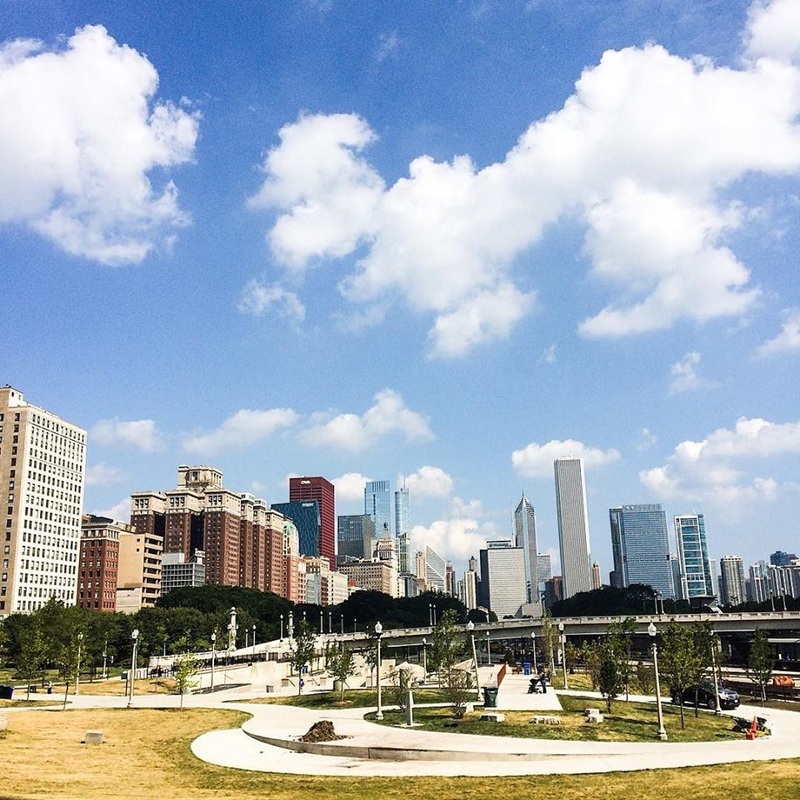 The location was out of downtown a bit, in South Loop, but neighboured on a cute area of townhouses, bike paths and close to the waterfront. Sprinkles Cupcake Bar and ATM Really not much explanation needed, the famous Sprinkles cupcakes from NYC has an ATM machine outside of their Chicago location. An ATM, that dispenses cupcakes, not money, cupcakes! Yes, I too was mind blown, addicted, and in love. It is a must visit, even just to see a stranger order from this electronic screen that dispenses their soon to be sugar high. The Rooftop Io Godfrey Chicago has a lot of amazing roof tops, but this one not only has the view but also a great vibe, good cocktails, a retractable roof and really awesome food. If you can snag a spot to eat and gossip with friends on a beautiful night you should definitely go for it. The burrata and artichoke spread is a must try! Specialty drinks from Three Dots and a Dash Three Dots and a Dash is a modern day tiki bar speak easy. The entrance is off of a side alley close to the downtown hustle and bustle (think right across from the famous RPM Italian). They serve up drinks garnished as an art, and each drink comes in a different signature tiki glass made just for them. Be warned, the little skull next to the drink name isn't for decoration, they warn you of the "death" that come with that drink (think spicy peppers next to your order at a mexican bar). Birch Box Pop Up Shop One of my favourite parts of my weekend in Chicago was visiting the Birchbox Pop Up Shop that set up shop right in front of the water tower (just west of the Chicago river). Birchbox, a favourite at home subscription service, bringing monthly boxes of cosmetic and beauty products to their clients, took to the streets to engage with customers. (One of the best things any online service can do... bringing a personal touch in real life.) Not only did they inform locals on the subscription service, sell full size products of both their men's and women's popular samples, and offer free grooming services for men, manicures for women and a donut and iced coffee bar (yup! ), but you were also able to make your own box. I grabbed a box (this one happened to be a collaboration with a long time favourite of mine, Riffle Paper Co) and filled it with the choice of 5 samples from the selection available. If you are not familiar with Birchbox and Birchbox Man I strongly suggest you check them out. Stay tuned for more travel adventures (especially Chicago!). I'll be back in the Windy City a little later in October so follow along on the adventure via snapchat @samanthaecutler and Instagram @samanthaecutler and keep your eyes peeled for another blog post on my hot spot recommendations!